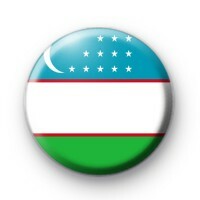 Flag of Uzbekistan Badge. This 25mm patriotic flag consists of three horizontal blue, white and green bands separated by two thin red fimbriations, with a crescent moon and twelve stars at the canton. Adopted in 1991. Our World flag badges are great for sporting events, patriotic themed parties & schools.